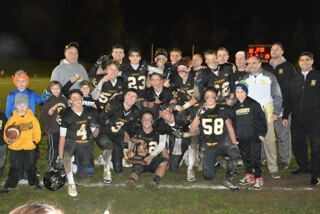 The Everest Collegiate Mountaineer Football team won the district title, beating Oakland Christian 20-0 on November 3. Read about the game in the Oakland Press here. The team will compete in the regionals on Saturday, Nov. 11, at 1:00 pm against Ottawa Lake Whiteford at Ottawa Lake Whiteford High School, 6655 Consear Road, Ottawa Lake, MI 49267.